Giving stocks and other securities is another great way to support AARCH. By making a gift of long-term appreciated securities to AARCH, you can avoid the capital gains tax that would be incurred if you sold the securities. A gift of securities also entitles the itemizers to take an income tax charitable deduction equal to the fair market value of the securities at the time of the gift. In order to avoid the capital gains tax, it is necessary to transfer appreciated securities directly to Adirondack Architectural Heritage rather than to sell them and contribute the net proceeds. When you give long-term appreciated securities, you can deduct the full fair market value up to 30 percent of your adjusted gross income for that year. You may carry over any excess contributions of long-term appreciated property for up to five additional years. Check with your tax advisor to learn about the specific aspects of giving your securities. 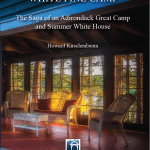 Gifts of securities to Adirondack Architectural Heritage should be made through the Adirondack Foundation, the community foundation serving our region, where AARCH has an established fund. As a first step in this process, please call the Adirondack Foundation office at 518-523-9904 and they would be happy to provide you or your broker with additional information including the DTC Transfer Instructions for making such a gift.